“A DESIGN FOR SAILORS WHO WANT THE BEST OF COMFORT AND SPEED.” – BOB PERRY. 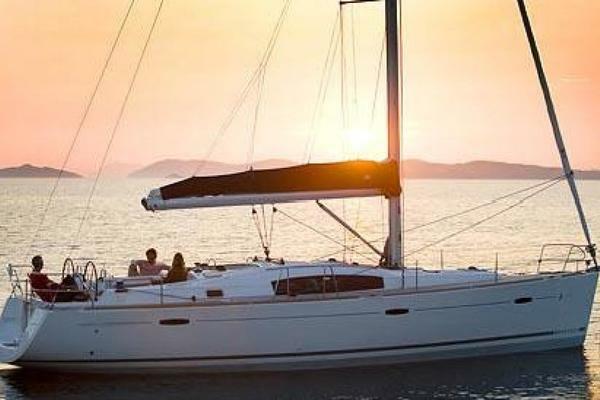 The Tartan 4100 is a proud, strong and graceful cruising sailboat that is as happy offshore as she is coastal cruising. Built to the highest standard by one of the best production builders in the USA, the Tartan has earned a reputation as a sailor’s sailboat, offering performance and comfort in a blend that is darn near perfect. All sail controls are led to the cockpit, which helps to make the boat a safe passage maker, and simpler single or short hander. The 5’4 draft and the performance of the Scheel Keel is a major advantage for tucking into those wonderful coves or cruising the Bahamas. And while a vibrant performer under sail, she is also a powerful boat under power – cruising at 6.8 knots at 2600 RPM. SECOND WIND is a one owner boat and has enjoyed “the good life” during her seasonal use in Connecticut. The owners have cared for her well, and made many upgrades from the bottom of the keel to the tip of the mast. She represents a solid choice for those wishing to step into a boat that is ready to go sailing today. SECOND WIND is highly recommended, and easily shown in Stonington, CT. The interior of the Tartan 4100 is designed for sailing – it is functional and commodious. The head is in the right place for use at sea, and the galley is a proper sea-going galley with the attributes that makes it outstanding. 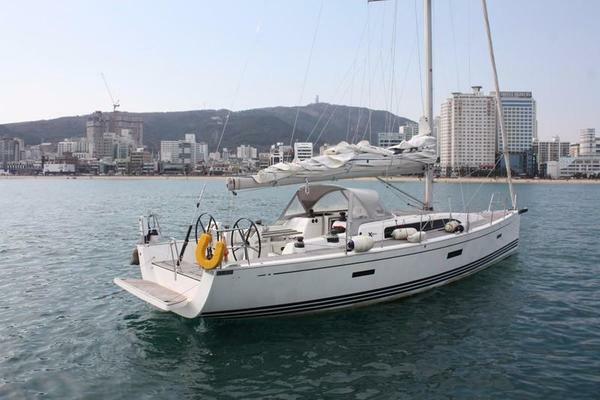 There are two large double cabins, a spacious salon, a proper navigation station, excellent tankage and storage galore. The interior is hand crafted in teak, with louvered doors for ventilation, and a teak an holly sole. The counters are Corian. The headliner is fiberglass, with teak trim, which is an expensive an functional upgrade over the vinyl used in many boats. The layout is semi-traditional – but with modern flare and features. There is a large forward cabin with double vee berth, a full width salon, head aft to port, navigation station opposite. A huge aft cabin is entered from aft of the galley, and to starboard is the very large head with separate stall shower, and a separate door from the aft cabin. Not insignificant is the staircase from the cockpit to the cabin – this is not a steep ladder – it is safe and convenient to use underway. The bottom portion of the ladder is hinged, with hydraulic cylinder assist, to provide access to the engine. Additional access from the head and aft cabin is excellent. Large V berth with storage shelves above. Custom mattress (similar to home mattress) for Vee-berth. SS Sink with storage above and below vanity. Hatch and two opening ports. Louvered teak opening panels in main bulkhead open to make both forward cabin and salon feel more spacious. Tanks under berths for excellent access and maintenance. Large lockers outboard in galley with louvered teak doors, built 2” deeper at factory to hold full sized dinner plates. Large athwartships berth – king size. Custom mattress (similar to home mattress) for this berth. Teak grate in shower, with sump and electric sump pump. Tall bridge deck for safety and seaworthiness. Custom steering pedestal with integrated drink holders and table supports. Drop down swim platform with swim ladder, which recesses into the transom when raised. 135% Genoa, 2016, Hathaway, Reiser, Raymond. Harken stacked ball bearing turning blocks. Harken 2 speed 40 2winches on cabin top Halyards, main sheet, boom vang, etc. Keel stepped mast, recently awlgripped. Simpson Lawrence Sprint 1000 electric windlass with controls on deck. Winch handle manual override. Chocks in Toe rail forward and mid-ships. Two dorade boxes with polished cowl vents and SS guards. 4 Lewmar deck hatches. Two aft hatches ordered larger than standard. Forward hatch just replaced. Integrated drink holder and table mount in pedestal. Floor timbers under salon sole rebuilt/upgraded to Mahogany – this is a correction of a common T4100 issue.